The AZUB MAX is optimized for all-terrain challenges. It is an impressive bike, even when standing still. A range of upgrades suit it for your needs. The MAX is all about no compromise touring. On-road, off-road, county road or Silk Road, the crew at AZUB loves to see bikes loaded with ridiculous amounts of cargo, traveling across rugged and picturesque landscapes. The large 26” or 24” wheels climb over obstacles or smooth out potholes. 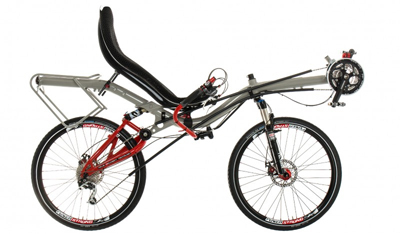 The rear suspension, with optional full suspension, makes the going much easier. You can’t pop a wheelie on it, but we’ve seen our customers drive these up curbs and down stairs. For playing in the dirt, AZUB recommends the under-seat steering handlebars. This gives you less to hang up on should you dump the bike spectacularly. For prolonged off-road touring, they suggest the OSS handlebars, which are less like to be damaged if a loaded bike falls. Open cockpit, or OC steering, is best for multi-day rides at higher speeds where aerodynamics figures in. Not-so-tall riders will appreciate the 24 inch wheel version. From the fire roads in your state park to tank tracks in the Negev desert, the MAX will take you there. As a commuter bike it will handle anything the fiends at your Department of Transportation dish out at you. AZUB MAX is a chariot you will fall in love with. When you sit on it, you cannot but beam with delight. Or even squeal with joy. This bike runs like clockwork, it devours all straight roads like nothing before and going downhill is a never ending joy. 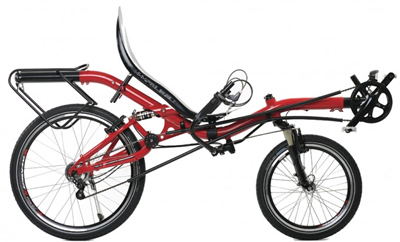 With its two large 26” wheels it is a recumbent like none other. The rear suspension is supplied as standard, and together with the optional front suspension, the AZUB MAX is a comfortable and fast bike which turns a road full of potholes into a smooth asphalt thoroughfare. A robust main frame tube extending from the boom to the rack. 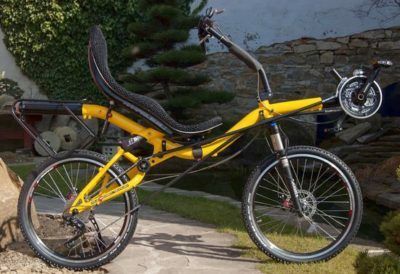 An asymmetrical organically shaped rear fork. A pulley following the movement of the chain. Robust appearance. All this makes the MAX an icon which hundreds of cyclists have fallen in love with. 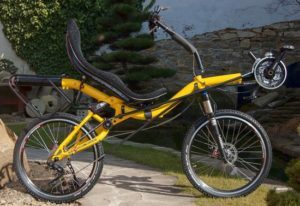 The AZUB MAX will make you feel that you can do absolutely anything, go round your town ten times or conquer a continent. Everything is possible and anything you decide will be incredible fun. 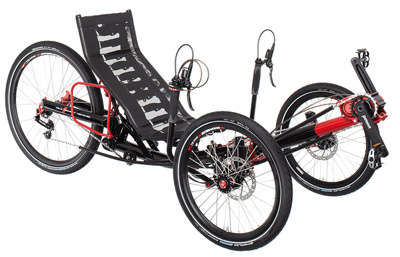 The MAX is a recumbent bike for active cyclists who enjoy a fast ride and great challenges. 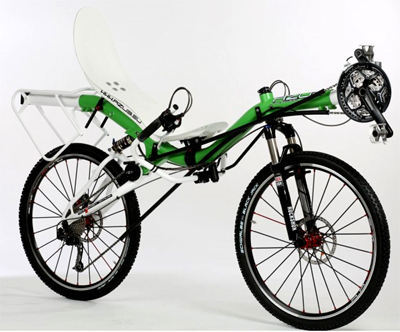 Unlike our recumbents with a 20” front wheel and 26” rear wheel, it has a more sporty seating position, characterized by the crankset being placed higher than the bottom of the ergonomic seat. The rider is thus better seated and can put more power in the pedals.